Boil the chickpeas in their water until soft. Strain 1/2 of the water. 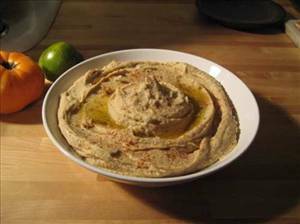 in the food processor ground chick peas and add the cumin, salt, lemon juice, garlic, tahini and mix to make a paste. To change the consistency, do the following: if the paste is too thick slowly add cold water while stirring until desired consistency; if too soft slowly add more tahini while stirring until desired consistency. When satisfied with the paste, place in a serving platter and sprinkle the olive oil on top and serve. 379 members have added this recipe to their cookbook. 1 serving is 1.5 oz. Would add a bit of paprika or chili garlic paste next time. This recipe comes out good. instead of regular water, use the water from the beans. Add a bit of flavor. i love hummus! i made some today, but instead of cumin, i sprinkled some paprika on the top. very heart-healthy dish & great with pita bread! LOVED it. Didn't even use the oil - it was so so great! Thanks for sharing! I just submitted a recipe for fattoush which is a Lebanese Salad often eaten along side hummus. I was going to add a hummus recipe but this one is perfect. There are 135 calories in 1 serving of Garlic Hummus II. Calorie break-down: 56% fat, 35% carbs, 9% protein.